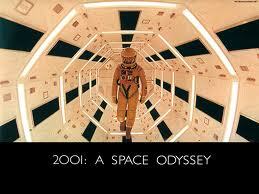 Stanley Kubrick's "2001: A Space Odyssey" was released in 1968. At the Los Angeles premiere of the movie, over 200 people who made up the guests at the VIP showing walked out on the film. At first, MGM, which financed it, was disappointed in the film as an audience draw. Many complained that the film was confusing and dull. But a groundswell of momentum in the United States and other places began to build from younger people who went to the movie, many coming back a second or third time in short intervals to try and absorb the movie's myriad symbols and ideas. I was lucky to see it again recently on a big screen again thanks to a one-day re-release at a theater. I first saw this film at age eight with my father. I can remember asking him all sorts of questions about the movie after we left the cinema. I don't remember his answers, but that was not the point. I'm sure he took me to this movie because he knew it might spark my imagination as did so many other adults did with their kids, brothers, sisters, friends, etc. And it certainly sparked my imagination. 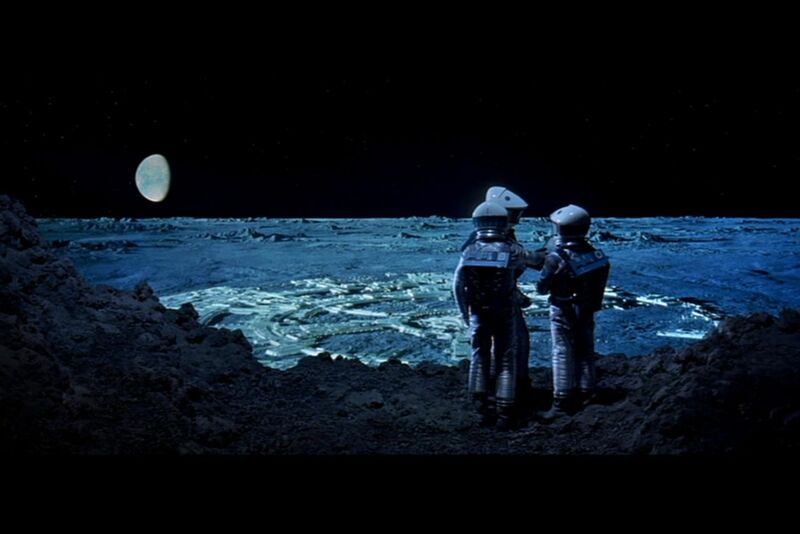 When the film was released a few years later I went to it as a teenager with a friend and tried to piece together the messages that Kubrick and writer Arthur Clarke, art designer Douglas Trumbull and others who worked on this extraordinary film brought to it. I was just beginning to learn about symbols and sociology back then, but I knew this was a rare and truly unusual event--a big-budget, commercial and profound movie. It was also unique in that so many individuals had varied interpretations from seeing it. Professional critics and intellectuals in print media were all over the map as well. I've seen it also on television a couple of times and the story still is both perplexing, disturbing and, in someways both a terrifying allegory of the future and a oddly wonderful experience at the same time. Rather close to real life, actually. It is a film that beings literally at the beginning-- for mankind that is, showing how the first proto-humans lived among the other animals of the savanna and were group together in small bunches in a struggle for day-to-day living. A large and metallic door-like monolithic object appears one day accompanied by a unearthly choir-sound. And then one of the hominids discovers how to use a tool as a weapon. This is a quantum leap in mankind's ability to dominate other tribes and become hunters instead of just gathering and grazing for food. It is to evolutionary equivalent of winning the biggest lottery of all--everything from fire to the atom bomb to a cure for small pox and polio will come from this moment. And then the film makes one of the most amazing cuts in cinema history---straight into space and a passenger ship bound for the moon, carrying a scientist sent to investigate a strange find on an American lunar base. This investigation tales up the second act of the film, and the content of the scenes, which include the reappearance of that door-like object, focus not so much on character development as probing the ultimate uncertainty of human existence. Those who have seen this movie before--and may who haven't--know what I'm talking about--at least as far as they recall the third part of the film---the Jupiter Expedition and the battle between the two astronauts who are in charge of getting the rest of the induced-hibernating crew to the giant planet and their relationship with HAL, the super computer on board the ship. This is where the strongest parts of the movie come into play--the fight between human will and a computer with an artificial intelligence, and which of these beings--organic or inorganic--will hold sway over the other in the race to the next quantum jump into a higher understanding of the universe. The struggles between a race of people dependent on machines and divorced from their natural environment and its own synthetic creations. Anyway, on any screen or television, and one's attention and imagination open--- this is a movie to visit, revisit and maybe find new questions to ask and answers to discover. "This 150 minute film boasts no outstanding performances, nor really any ordinary narrative flow. Indeed, the film almost dares the audience to think it's undramatic. But there is method to this type of storytelling, to get the audience to focus on human developments...."
Are you a Christian existentialist on the order of Kierkegaard? Otherwise, I would feel that what you've written here would conflict with your faith and personal values. You write of an evolving species not far removed from its fellows. But for the interference of the mysterious obelisk it could have gone on living at the basest of levels. This obelisk interferes twice more- perhaps intervenes -in the evolution of the human species. The Space Odyssey implies and predicts its outcome. Being about your age, I'm not sure but I'm guessing late 50's, I was a part of the generation heavily influenced by post-WWII socialists and existentialists. I can remember fresh out of primary school being exposed to Bradbury through readings of his 'Dandelion Wine' short stories. From there it was Asimov (albeit a bit heavy), Huxley, Vonnegut and Hesse. We were the children of the Space Race, and our children of the Hal age of technology. What will become of us all is anyone's guess. I recently saw the film 'Cloud Atlas', which is based on author John Mitchell's intricately woven novel. It too is an interesting read of an interlinking past, present and future. I enjoyed this review of yours here, Doug. Thanks a mil! Thanks for your generous comments on my blog first off. I am familiar with some of Kierkegaard writings through books about his life and ideas like the "the leap of faith" and the subjectivity of reality. But I cannot claim to be a very good student of his work. The main albeit non-Christian existentialist writer Albert Camus has had a clear influence on my thoughts as well, especially his collected essays in books like "The Myth of Sisythus", "Resistance, Rebellion and Death" and his novel "The Plague". Most of the writers you mention, Shers, have certainly had influence on me, except for Hesse which I must confess I haven't read much outside of his book on the Buddha. Certainly Vonnegut and Huxley! Have you ever read Vonnegut's "God Bless You, Mr. Rosewater" from 1965. It has a lot of great humanist wisdom in it and it's wonderfully funny and 100% American to me, in the best sense of his being a modern Mark Twain or Ambrose Bierce. My favorite writer for a lot of college and early adulthood was Graham Greene's work, fiction and memoirs. Greene's "The Heart of The Matter", for instance, seemed to encompass a lot of the angst of modern life. I came rather late from a skeptical and rather offhand agnosticism to a mature faith in God in my thirties and strive to be in C.S. Lewis famous phrase simply a "mere Christian", so if I have an existentialist bent to my thinking, it's quite unintentional . How this effects my view of "2001" now I confess I'm not altogether sure. I am certainly a "child of the Space Age" first and foremost and too enjoyed "Cloud Atlas" for it's strong narratives and sense of our common struggles of ordinary human against injustice and the racism and the rise of the corporate state in recent time. Not that I blame Charles Darwin. (I'm not one of those US Christians I hope!) I don't fault evolution or science one bit, but i reserve a place for God and the mysterious and the great questions of why which science is not going to answer for us as individuals. Parson me for droning on. I hope I've given some idea where I coming from here. Thanks for you friend invitation to Facebook now that Multiply is a ghost town.